ESPN’s Dan Le Batard built a sports-talk empire by talking about sports as little as possible. Photo illustration by Slate. Images by ESPN/@LeBatardShow. Do You Get the Show? What kind of soup was it? What was Jones wearing? Was it, hopefully, a white suit? Did Smith throw the bowl or just the soup? If he did throw the bowl, was it Frisbee-style? End over end? This is The Dan Le Batard Show with Stugotz, the weirdest and funniest non-sports-focused sports radio show in America. The Clevelander Hotel, on Miami’s South Beach, feels less like a hotel than a hangover you can sleep in. It appears to have sprung spontaneously from the sand, perhaps when a Lamborghini dealer spilled tequila on a magical turntable, and provides its guests with both a stunning view of the Atlantic Ocean and the diametrical opposite of a good night’s sleep, thanks to the 24-hour Pitbull video raging in the outdoor courtyard. * It is—and it’s odd that this even needs to be said—an insane place to make a televised sports discussion show. Or a sports talk radio show, or a podcast. It’s an insane place to make anything, really, except frozen piña coladas, which are, unsurprisingly, handed to you as you check in. But indeed it is here at the Clevelander, in two cramped studios overlooking that same ceaseless courtyard bacchanal, that Le Batard creates an enormous block of content for the most powerful sports and entertainment company in the world. In the auxiliary studio, the 49-year-old Le Batard, his father Gonzalo “Papi” Le Batard, and a rotating band of hosts tape his ESPN TV show Highly Questionable as well as several weekly hits for various ESPN properties. In the main studio (which is somehow smaller than the auxiliary one) Le Batard, Stugotz, and a tightknit team of producers, sound engineers, and talent-bookers make a four-hour daily radio show—a Miami-only local hour from 9 to 10 a.m. that flows seamlessly into a three-hour national show for ESPN Radio, which is also televised on ESPNews. The radio show, which has existed in one form or another for 15 years, has never been more popular. 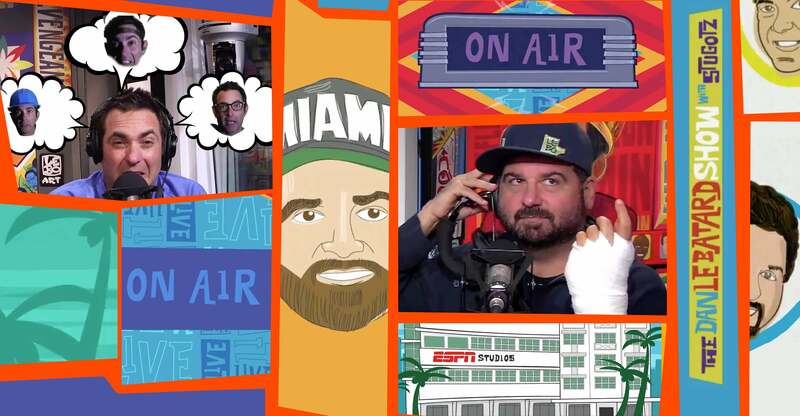 On terrestrial radio, The Dan Le Batard Show with Stugotz has an audience of 2.2 million people a week, and it’s heard in 11 of the country’s top 20 markets. (During the week I visited in early March, an AM station in San Diego announced it was dropping Southern California’s own Jim Rome in favor of Le Batard.) Podtrac says downloads of the show’s podcast grew by 79 percent from January 2017 to January 2018, and ESPN says total downloads exceeded 53 million in 2017. If you made a list of the things Le Batard and his crew spend the most time talking about, “sports” would be maybe fourth. When they do discuss the sports stories of the day, they do so obliquely, or parodically. In January, Bleacher Report’s Chris Simms came on to defend his claim that the Jacksonville Jaguars’ Blake Bortles is the 70th-best quarterback in the NFL. There are only 32 NFL teams, so Simms was claiming that a playoff-caliber quarterback was worse than every other team’s starter, and backup, and several third-stringers. It’s the kind of statement a revved-up sports radio host can yell about for hours. But instead of shouting down Simms, Le Batard had him come on to explain who was No. 71—the answer: Cody Kessler—and then had him back every weekday afterward to read (with great fanfare) one more name from his list of the 69 quarterbacks better than Blake Bortles. Simms’ “70-day contract” had him discussing NFL quarterbacks almost two months after the football season had ended. Most of Le Batard’s peers have a professional obligation to be angry—or at least voluble—about a dozen or so sports things per episode. On TV, the standard formula calls for two men, typically one white and one nonwhite, to debate whether LeBron should go to L.A. or if the Cleveland Browns would be best served by trading the No. 1 overall pick. They argue loudly for several minutes, then move on. The men—and it’s almost always men—must never agree. Not ever. It never happens that one of them says “The Milwaukee Bucks are underrated!” and the other says “I concur!” and they nod and shake hands. On the radio, the formula changes a bit. The hosts pick a topic from the sports zeitgeist, often one that has no business being discussed because the answer is unknowable, and thus any “analysis” is mere guesswork. Can the Philadelphia Eagles repeat as Super Bowl champs in 2019? Could in-his-prime Michael Jordan have beaten in-his-prime Steph Curry in a game of one-on-one? Will humans ever develop the ability to teleport, and if so how will that affect NHL power plays? Then—and this is the part that really drives Le Batard nuts—they get their listeners to provide content for them by taking a strident position and sticking to it, while telling their audiences of wound-up sports lunatics to come at me, bro. The more the hosts dig in their heels, the angrier their listeners get, and the more of them call in. The industry term for someone who engages in this loud, fact-free pontification is a “gasbag.” The loud, fact-free declarations he makes are “hot takes.” And hot-take sports gasbaggery, for years now, has been a very profitable business. Le Batard: … It’s kind of a middle school show. Papi: This is the Dan Le Batard Show with Stugotz on ESPN Radio! Which is not to say the show is purely frivolous: Le Batard has made his name in part by discussing race in American sports, and the show feels most vital when the subject is Colin Kaepernick, or Jemele Hill’s Twitter fight with Donald Trump. Indeed, the show’s interest in race—and more recently, gender—highlights its defining impulse: to focus on what it wants, when it wants. And what Le Batard wants to talk about is rarely what you’d expect the host of a national sports radio show to want to talk about. When he does discuss some ongoing sports curiosity—a winning streak by a seemingly mediocre team, for example—he flaunts his own lack of knowledge, asking, “How is this happening? Is this even true, what I’m saying? Can someone help me? Because I don’t know what I’m looking at.” He traffics not in hot takes, but in confusion, nuance, and happy ignorance. Le Batard traffics not in hot takes, but in confusion, nuance, and happy ignorance. Le Batard, who by 2011 had 10 or so years of experience goofing around on local radio, was the perfect person to steer ESPN away from gasbaggery. But that doesn’t completely solve the mysteries I’m interested in—the mysteries that sent me down to Miami and made me check into a Spring Break Fever Dream of a hotel: How can a show that mostly consists of goofy in-group navel-gazing continue to grow in popularity? How can it mock the medium of sports radio and also thrive within that very medium? How can it waste time talking about soup and also delve into the uncomfortable nuances of racial disharmony in sports, and do both things better than anyone else? Stugotz: I’m never gonna stop. I am what I am, man. I’m 44 years old, I ain’t changing. Stugotz: Why change now? It’s worked! Here I am. Sitting next to you. (giddy) Filthy rich. “Stugotz” is never called anything other than his nickname by anyone, ever. The show that now bears that Sopranos-inspired moniker is the result of relentless entrepreneurial striving—what Le Batard calls Stugotz’s “saucer eyes,” a frequently expressed desire to move up, achieve, get more famous, and make more money. It’s both a character exaggeration, played for on-air laughs, and a real character trait, one that led Stugotz, 15 years ago, to rent a block of time on Miami’s AM 790 The Ticket and meet Le Batard—then a writer for the Miami Herald—at a Starbucks to convince him to help build a “younger, hipper, cooler” sports radio station. “We didn’t have [chemistry] instantly,” says Stugotz. “I drove the show, when we first started … and it was bad.” The ratings were low. Neither of them could sleep from the stress. Rival media station managers called them—and they each remembered this term independently and brought it up unsolicited— “sissy boy radio.” It was when they flipped roles—Le Batard driving the car, Stugotz in the passenger seat—that things started to click. Stugotz is variously described by those who work with him as the show’s “secret sauce,” “the funniest man at ESPN,” “the court jester,” and “the voice of the everyman.” On March 2, Le Batard began the local hour with a lengthy investigation into how the Los Angeles Lakers managed to drub the Miami Heat the night before, putting up 131 points. How could this have happened? A call to regular guest and former NBA front-office executive Amin Elhassan was quickly arranged, and Le Batard started right in: What advanced NBA analytics could explain the Lakers overcoming the objectively weak defense provided by their new point guard Isaiah Thomas? As Elhassan gave a typically thoughtful and complex answer, Stugotz looked—and then sounded—annoyed. “It’s basketball, man. The Lakers scored more baskets. That’s hoops! That’s it!” This is Stugotz’s first job on the show: to pull the discussion down from its sometimes lofty, meandering mode, and tell all the overthinkers to get over themselves. But Stugotz is not just a gasbag. He is, thanks to his 15-year partnership with Le Batard, a completely self-aware gasbag. This is Stugotz’s second job on the show: to mock everything he said while doing the first job. In the moments after his anti-intellectual, anti-mathematical declaration, the show repurposes “That’s hoops! That’s it!” into a parody of the thing it was, making fun of Stugotz for his reductive simplicity, and posting a Twitter poll on the show’s official account that reads, simply, “That’s hoops, that’s it?” with zero explanation of the context or meaning of the question. (Side note: There has never, to my knowledge, been a Le Batard Show Twitter poll about a serious sports issue. Other recent examples include: “Is that something that you would want to do?”, “Can you get mad at Sweet Tomatoes?”, and “If you haven’t smiled in a decade are you weird?”) Stugotz’s everyman persona, and his (and the show’s) gleeful mocking of that persona, is one of the greatest have-it-both-ways high-wire acts ever performed. The Stugotz Opinion is both itself and a parody of itself. It’s Schrödinger’s Take. Stugotz’s idol growing up was Chris “Mad Dog” Russo, who ranted about New York sports for decades alongside Mike Francesa on WFAN. During the show I watched, coincidentally, they played an old favorite audio clip: Russo frothing at the mouth for a full 60 seconds about some incredibly mundane aspect of the 2015 “Deflategate” scandal. I posited to Stugotz that if he hadn’t met Le Batard, that’s who he would be now—not a self-aware gasbag, but just a gasbag. Le Batard: Good work today. That was a fun show. Le Batard: It was also intergalactically stupid. The Le Batard Show’s production team—Ryan, Turner, Roy Bellamy, Chris Cote, and Billy Gil—sits in a glassed-in enclosure in a tiny studio. Le Batard calls them the Shipping Container of Frightened Refugees, and he believes that the more the Shipping Container contributes to the show—the more they actually speak, into the mic, on-air—the better the show is. At one point during the show I watched, Gil and Cote began jabbering about carnivals for no apparent reason. Le Batard stood up, gave them the “keep going” gesture, and walked out of the studio. They kept talking until the segment ended. Le Batard proudly refers to the show as a “marching band to nowhere” because it is constantly dreaming up huge projects and then forgetting about them and drifting somewhere else. Back in January, they planned a huge ceremony to declare the undefeated University of Central Florida football team the “real national champions,” and then it all sort of fell apart. When I visited, the massive, elaborate trophy they had made and planned to present to UCF head coach Scott Frost was just kind of lying around on the studio floor. Le Batard proudly refers to the show as a “marching band to nowhere” because it is constantly dreaming up huge projects and then forgetting about them. Le Batard: White people maaaaaad! Try to get me fired. Go ahead. Get petitions together. ESPN is a giant, lumbering, monolithic company that got gianter, more lumbering, and more monolithic when Disney recently announced the purchase of dozens of Fox assets, including several regional sports networks. For years, Fox Sports had tried to mount a challenge to ESPN’s dominance in the sports media world, launching new channels like Fox Sports 1, luring away ESPN talent like Skip Bayless and Colin Cowherd with rich new contracts, and generally spending massive amounts of money to knock ESPN off its perch. The sale of their assets to ESPN was largely seen as capitulation. ESPN is now the great white shark of the media world: It has no natural predators. But that doesn’t mean it doesn’t have problems. Several recent rounds of layoffs, the result of revenue lost to cord-cutting, sparked their own cultural hot take: The network is straying too far from its “base,” getting too “political,” and pushing “diversity” at the expense of everything else. All of these arguments essentially amount to: There are too many nonwhite people on my TV! When the show does get serious, those smart people give the Le Batard Show a very deep bench of informed opinions. Back in 2014, when then–Clippers owner Donald Sterling was caught on tape using racial slurs, Le Batard called on Bomani Jones, who delivered a scathing, brilliant, off-the-cuff, four-and-a-half minute monologue on housing discrimination that remains one of the most impressive things ever to come from the show. On Dec. 18, Le Batard broke down on-air at the news that ESPN President John Skipper was unexpectedly leaving the company. At that moment, details were scarce—Skipper wouldn’t go public with his story of cocaine-related extortion for three months—and as Le Batard choked back tears, he wondered aloud about the fate of his close friend and mentor. During our time together, I mistakenly referred to Le Batard’s parents as Cuban immigrants, and he politely corrected me: They are exiles. The fact that his parents gave up money and status in Cuba to come to America, so he and his brother could live freely, is at the front of his mind all the time. At one point, as I watched the team prepare to tape Highly Questionable, Le Batard went to the back of his elderly father’s chair, bent over and hugged him, whispering something in his ear. Papi patted his wrist paternally. The moment was quiet and lovely. It is also, probably, the answer to the question that sent me down here. How is any of this possible? It’s possible because The Dan Le Batard Show with Stugotz is the unfettered vision of a tightknit group of people, surrounded by their close friends and loved ones, who feel uncommonly content and creatively free. It’s the work of a group of people who all get their own show. Source audio by ESPN Radio/The Dan Le Batard Show with Stugotz. *Correction, April 13, 2018: This story originally misidentified the ocean that’s visible from the Clevelander Hotel. It’s the Atlantic, not the Pacific. It also misidentified J.R. Smith as a point guard. He is a shooting guard. Mike Schur is a TV writer and producer. His show The Good Place⁠⁠ will air its third season this fall on NBC.